Brownies. Oh...chewy, rich, delectable brownies. I have to say they rank right up near the top of my all-time favorite desserts. Or dessert components. That's right...I often break desserts up into components when I think about them. Take for example, any pie. You've got the crust component. The filling component. And then a top-crust component. Or maybe that top-crust is a meringue. Or maybe it is a streusel. Or maybe it is some sort of whipped topping component. Who knows? What I do know is that there are probably millions of potential combinations of crust/filling/topping components. Throw on some kind of a garnish such as toasted coconut or chocolate shavings and there's another component. I'm no mathematician, but that is a frighteningly obscene number of delicious options out there just waiting for us to taste. I'm rambling. My point is simply that the brownie is a magical dessert option, either alone, or as a component. 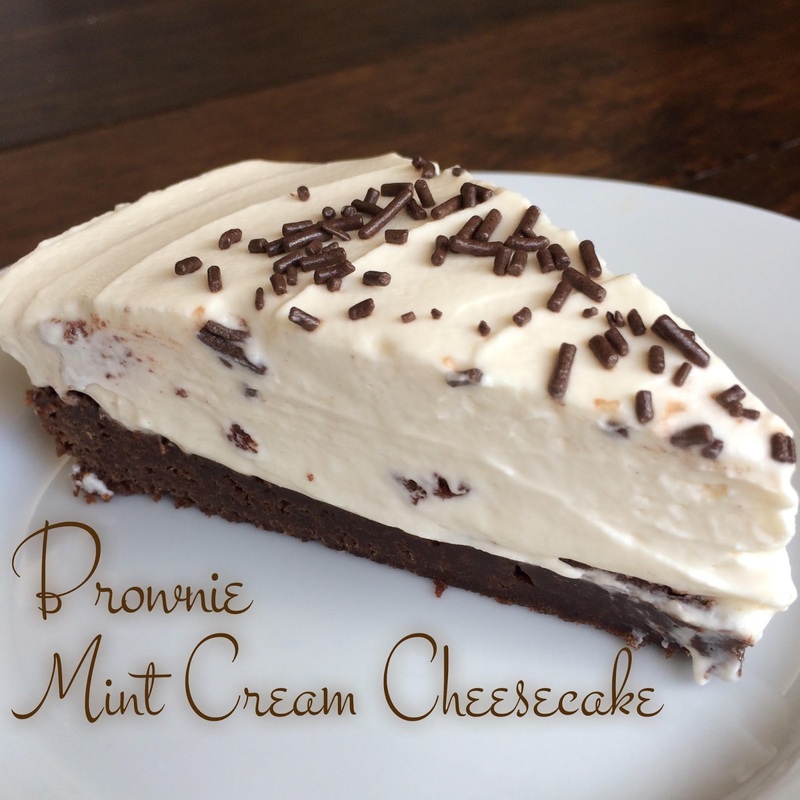 In this case, I used it as a base component to this super quick, no bake deliciousness that I have called the Brownie Mint Cream Cheesecake. You're welcome. My inspiration for this actually came from the fact that I just didn't have enough of the ingredients required to complete the dessert I was actually in my kitchen trying to create in the first place. I originally went in with the thought that I was finally going to make (and this time, write down) the ingredients required for a brownie chocolate mint baked cheesecake that I made this past summer. Some of my friends will know what I'm talking about (ahem, Trina). I swear, I'm working on it for real. The problem was, I had made the crust, was all ready to rock, and then realized I didn't have enough cream cheese to make it. How crazy. I always have approximately 87 packages of cream cheese in my fridge. I kid....it's usually probably only 4 or 5. This time, though, I had one. Just one. How could that be? -Combine flour, salt and baking powder in a small bowl and set aside. -In a small saucepan, melt butter. Remove from heat and add the sugar, vanilla and cocoa. Whisk until smooth, and allow to cool slightly. Whisk in eggs. Stir in flour mixture until well combined. -Pour into a 9 inch springform pan (lightly sprayed with cooking spray). -Bake in a preheated 350F oven until just done. This should be about 25 minutes. Do not overcook or your brownie will be crusty. -Place pan on a baking rack to cool (for about 1 hour) and then place in the freezer while you prepare your filling. -Beat the cream cheese until very light and fluffy. Add extract and whip until fully combined. -In a separate bowl, whip the cream until peaks form (they should hold a good shape). Gradually add icing sugar and whip on high speed for about 45 more seconds, until the whipped cream is quite thick and really holds it shape. -Scrape whipped cream mixture into cream cheese bowl and whip at high speed again until fully combined. -Spread filling mixture onto fully cooled brownie crust and smooth with an offset spatula. I added chocolate sprinkles to mine at this point. -Refrigerate for 4 hours before serving. Cut these pieces small! It's rich, and oh so delicious. I can attest that even though whipped cream makes up the bulk of the filling, it holds up very well. I was still eating this cake, piece by piece, a solid 3 days after creating this. The cream didn't weep or get runny at all. It stayed light and fluffy right until the bitter end.